Last week we asked about advertising in the phone book, and it looks like it’s a dying art. 40% asked if the Yellow Pages were still around. A majority do have a presence in the phone book, with about 32% going for more than a basic listing. This week we ask about your worst nightmare on a Sunday morning. So far havng half the congregation be left behind is out front, though we’re also getting some fun write-in responses. I killed all our Yellow Pages advertising a year ago–over $700 a month for a display ad–and put more resources into our website instead. It hasn’t hurt us one bit. 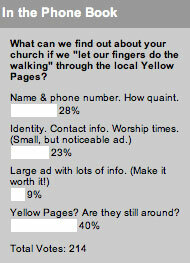 In fact, we find most people hit our website before they visit the church anyway, so the Yellow Pages was redundant. At the tremendous cost the Yellow Pages charges for advertising, I’m pretty sure at least for the church that it isn’t worth it anymore. Not sure I’d feel the same if I were a doctor or lawyer, but less and less I find myself looking at the Yellow Pages for anything. Google is the new Yellow Pages, and I’m far more interested in my ranking there than spending a fortune for very little advertising return in the phone book. A majority do have a presence in the phone book, with about 32% going for more than a basic listing. Actually, that’s only a significant minority. Similar but different. Actually Josh, a majority do have a presence in the phonebook. 28% have a basic listing, 23% have a small ad and 9% have a large ad. That’s a total of–wait, let’s see, carry the one–60%. I was pointing out that 32% (small ad plus large ad) have more than just the basic presence. As the head of a family of five that has recently moved into a new area, I can’t imagine a Church (that actually is passionate about why anyone new should attend at their place) not seeing the value of a decent ad in the directory. There is so much fluff in online searches, plus when you wake up on a weekend, the last thing I want to touch is a computer (I work on one all week long).